Why Does Your Child’s Playroom Need Jigsaw Mats? Most parents are very concerned about their child’s health and well-being. They make sure their environment is safe and suitable for children of their son’s or daughter’s age. They make sure all drawers have child proof locks, stairs have gates, and all electrical outlets are plugged. A child’s play area should have some added protection, especially if you have a very active and sporty child. At Ezy Mats, we encourage parents to take steps to provide a safe and secure environment for their child. You should start with the floor and make sure it’s covered with soft jigsaw mats. 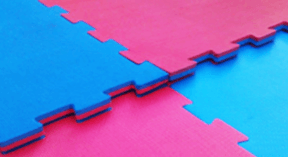 Jigsaw mats are made from ethylene vinyl acetate or EVA. This material is soft but firm enough to provide a stable surface to walk or run on. This material is cut and shaped to form interlocking pieces like a jigsaw puzzle. You don’t have to use glue to place them on the floor as the interlocking design will keep the entire surface in place. They’re perfect for children’s playrooms and gyms because you don’t have to spend money to remove them once your kids grow up. Why Does Your Child’s Playroom Need a Jigsaw Mat? The surface is soft so if your child does fall, he or she wouldn’t be hurt. Our mats are used in gyms, yoga studios, martial arts studios, etc, so they’re very resilient and will withstand rough use. These mats come in bright colours so they’ll be the perfect fit for any room, especially a child’s room or play area. The jigsaw shape also creates a beautiful design that can add to the decor of the room and make it feel livelier. These mats are easy to clean. You can wipe off the spills easily and use mild cleaners to sanitise the surface for your children. These mats are very resilient so as long as you use the right cleanser, you don’t have to worry about damage from cleaning. Unlike other flooring options, they are easy to remove and you won’t need professional assistance to handle that. As the jigsaw pieces are just placed on the floor and not glued to it, you can remove it at any time. So, if your kids grow out of their playroom, you can remove the jigsaw mats and reuse them elsewhere. You can easily reuse the mats in a home gym.